The notes from this Meetup are going to be like I do notes after a retro for any of the teams that I work with. A description of what we did and relevant info on the results. Everyone was asked to write on a post it note how you would describe 2016 with one word – you may also use one song, book, or movie title, even if it is more than one word. 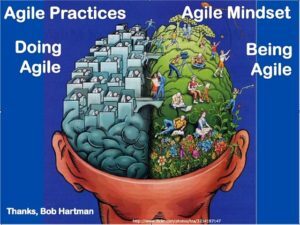 Is thinking about being agile vs doing agile new for anyone? 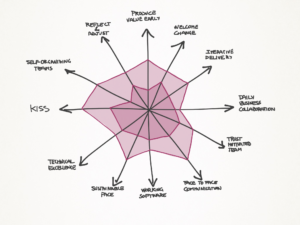 Is anyone seeing any areas where things could stand to improve at your job? RESULT: It wasn’t exactly new for anyone but after looking at the handouts they were thinking about it in a different way and saw that there was a major difference, AND that it was often the missing link between how things “should” be and how things “are”. Everyone saw areas where things could improve at work and within ourselves as well. Set the goal/ context (1) The goal of this retrospective is to look at being agile vs doing agile, to identify and gather feedback from each of our places of employment, and to create action items to improve challenges as well as continue to maximize what is working that any team could also use. 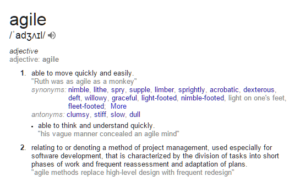 Ask the team about the twelve Agile principles. 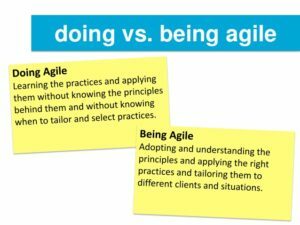 If they know it jump to the next point, if they don’t do a brief introduction to Agile values and principles. Ask all team members to stand up. Keep reading until everyone is sitting down. RESULT: Everyone sat down within the first 6 principles , but I continued reading through all of them and then everyone shared if they would stay sitting or not on each one. 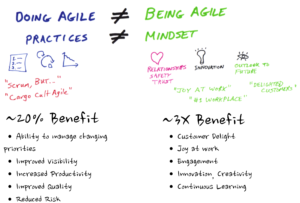 While thinking about the difference between BEING Agile and DOING Agile factor in how things are at your place of employment and/or these Agile Meetups. Then think about what things you would drop and what you would add. What you would keep and what you would improve on. Please write one thing only per post it note and when you are finished go ahead and bring them up and place them where they go. Since we are all on separate teams this is not the same as it usually would be but I thought we could still take a few that have several people mentioning them or are the most common and we could come up with some Action Items that any one of us could take back to our jobs and implement. Action Items – not in usual SMART format because of the nature of doing a retro for people working in different places etc. Don’t push, nudge OK depending on who? Companies should adjust their thinking to attract the type of people and skill sets they want to be added to their teams and acknowledge that these awesome people could also go work at other places like Google, or Facebook. Vertical line with smiley face at top and sad face at the bottom. 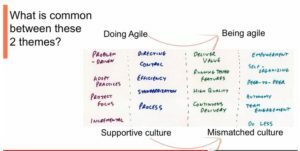 Asked for a post it note to be placed where on the scale you think it should be when thinking about your ROI on the retro/ meeting and if you want to say why good or bad just leave a note on the post it not and I will use the feedback to improve retros and you will have the opportunity to share your thoughts to make them even better.